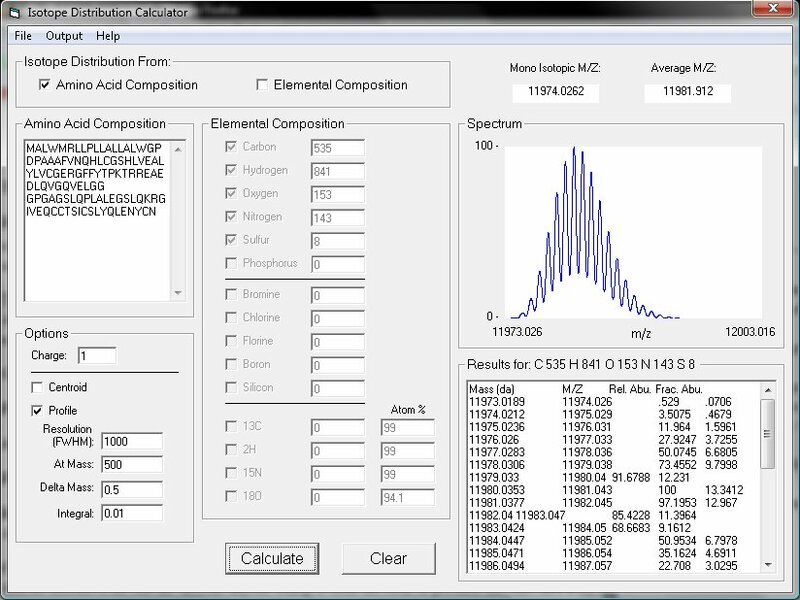 Background: IDCalc was developed to provide a simple way to view the expected isotope distribution for biological molecules measured by mass spectrometry. The program also includes the the ability to consider enriched stable isotopes. Input: Input is either as a peptide sequence or an elemental composition through the graphical user interface. Availability: IDCalc is free for non-profit use. Source code is available upon request. IDCalc is academic software and is use at your own risk. Platform: IDCalc has been tested using Microsoft Windows XP and Vista. Note: You might need to install the latest version of the Visual Basic 6 Run Time first before the executable will run on your computer. Go here to download the latest VB6 Run Time libraries from Microsoft. Also, on Windows 7 I have found that you have to register the COMDLG32.OCX library. You can do this by running "regsvr32 C:\SWTOOLS\Apps\MMCfto\System32\Redist\MS\System\COMDLG32.OCX"
Download: Right mouse click here and select "Save link as ..."